← 2nd OYO Circus Workout! Click on the photo of the workout above to download the workout, reference guide, and tracking sheet directly to your phone, tablet, or computer! Seriously, I couldn’t be more proud as the OYO workouts are not only getting DONE but everyone is helping one another, doing their best, and we can hardly keep up with all the packets flying off the shelf by people NOT doing this challenge and still wanting to work out like a Rebel! CLICK HERE for the last 2 weeks of OYO workouts! 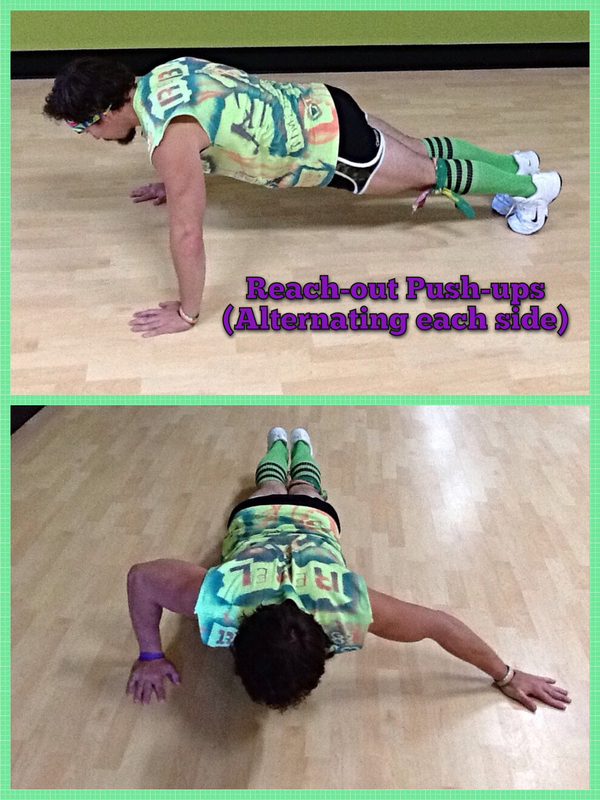 You can do this one in standard push-up position or kneeling, whichever your body can handle. Do a push-up, and at the bottom of the motion reach your harm out and touch as far away as possible before bringing it back and completing the push-up. Alternate each side. Find a bench, ledge, or chair that you can leverage yourself on to get this one going. Take a seat and place your hands shoulder width apart on the edge of where you’re sitting. Support your weight on your arms as you bring your hips off where you are seated before lowering your body as low as you’re able while bending at the elbow. Push your body straight back up and repeat! Be sure to keep your abs tight, stance wide, and stay on your toes. Do your best to keep your arms parallel with the floor, but don’t OVER squeeze and strain your neck or back. Start with 2lb dumbbells and work your way up from there. If you can’t fully extend your arms without them dropping to the floor at the end of the movement, then the weight is too heavy. 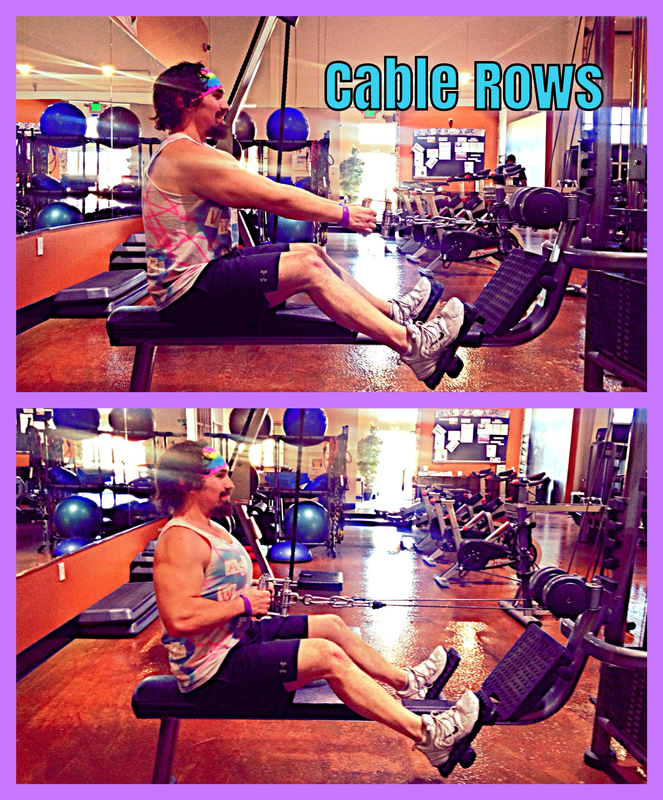 Locate the cable row machine and select the weight you feel comfortable with. Grab the handles (any hand grip that has your palms facing each other when they’re holding it), take a seat on the bench, and put your feet in the designated spots to the side of the bench. Keep your core tight and pull your arms back while squeezing your shoulder blades together. Careful not to shrug your shoulders upwards into your ears (very common so be aware!). As you let the weight back down make sure to get a full stretch in the arms before pulling back again and repeating! Locate the cable machine and rope grip (as pictured). 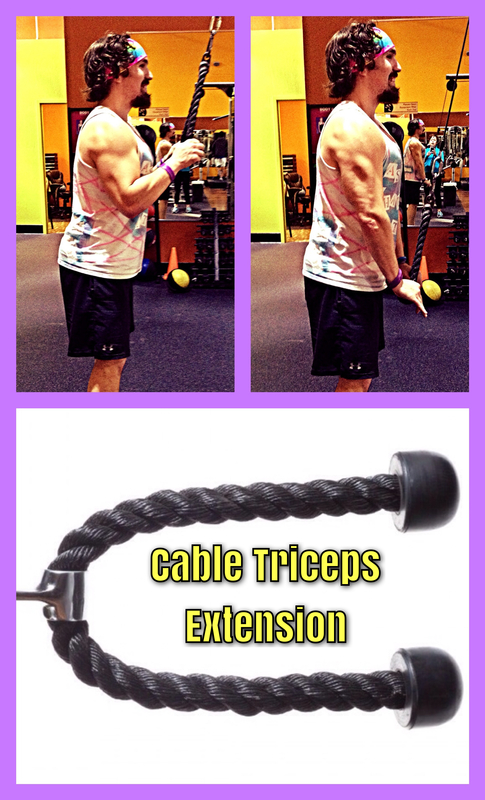 Some cable machines have adjustable pulleys so if that’s your club then learn how to adjust the pulley up and down. The ultimate goal is to get the pull all the way up so you can grab the rope attachment with both arms, standing with a stable shoulder width apart stance, and extend your arms all the way downward while allowing minimal movement in the elbows. Control the weight back up and repeat! 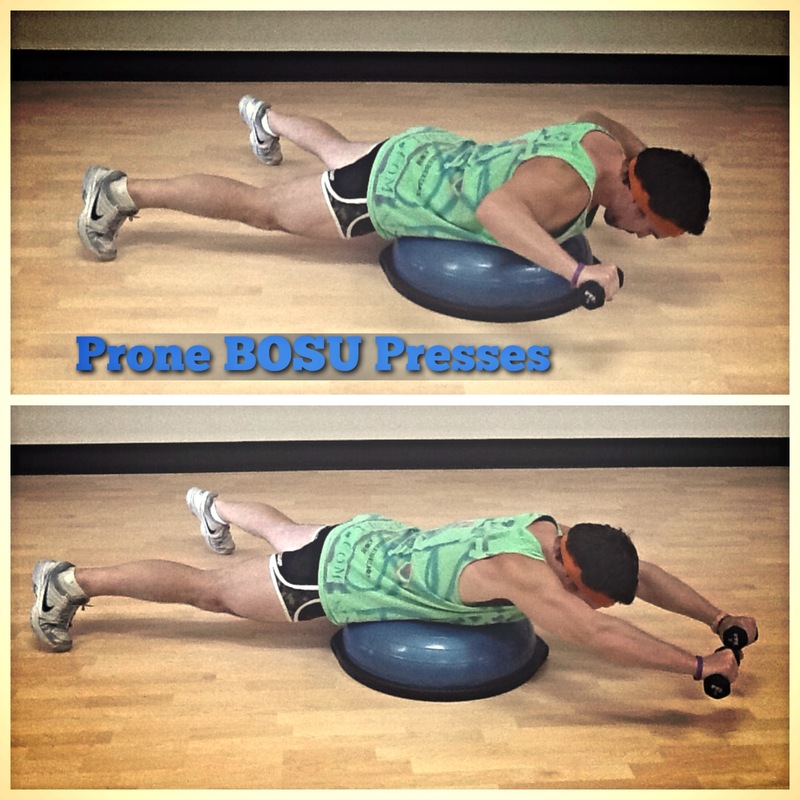 Make sure your handles are SUPER shortened and you have your BOSU underneath the anchor point. You want the handles to be short enough so you can sit on the BOSU securely with your feet extended in front of you while still holding on to the handles with your arms fully extended. Keeping your feet flat on the ground (easier) or staying on just your heels with your legs fully extended (harder) pull yourself as high up as you can while keeping your hips level directly underneath your shoulders. Lower yourself with control and repeat! 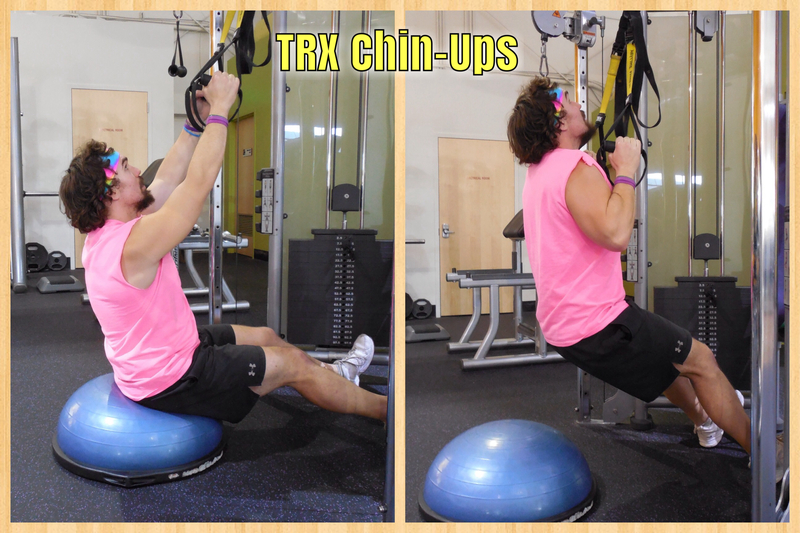 Grab only one of your dumbbells with one hand and only one of the TRX straps with the other. Walk into the handle so you are facing the anchor point with your body square and tension on the strap. Keep your dumbbell hanging at your side while using the TRX not only for keeping form but to help pull yourself back up as well. 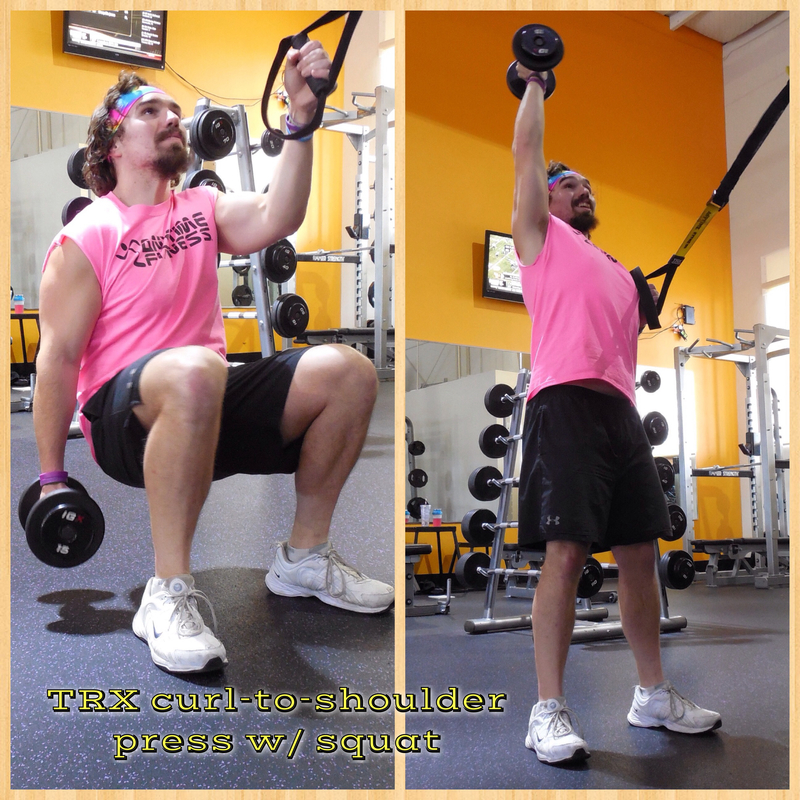 As you come back up curl the dumbbell then do a shoulder press. Bring the dumbbell back down as you squat back down then repeat! This one should be done kneeling by EVERYBODY. 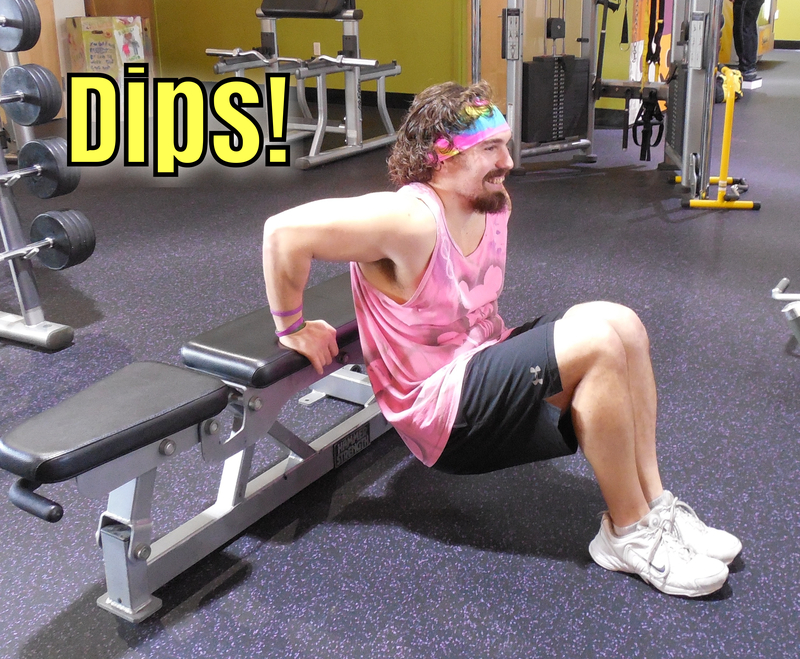 Not because you studs and studettes can’t handle it, but because the goal is complete triceps isolation (as much as possible anyway with a push-up). Remember to keep your elbows in at your side, body in a straight line from knee, to hip, to shoulder (no butts in the air!) and push from the heel of your palms.